Vector Securities Ltd is a brokerage company providing financial services in the international currency market. The broker offers its clients thorough analytical reviews and daily financial news as well as a variety of training materials. You can start working with Vector Securities Ltd by opening a demo account. Trading orders are placed through MetaTrader 4. The company grants traders an opportunity to take part in a number of contests and campaigns. For example, holders of micro, mini, and standard accounts can sign up for the Welcome bonus +30% program enabling them to win up to $1,000. Vector Securities is not at all fit for professional Forex Trading. Actually I open an account because of their referral bonus. During the last months my 10 clients are joined under my referral link and get 300 referral bonus. Last week withdraw $200 from my referral bonus through Skrill but they did not send it. When I contact with their support they told me that I can not with my referral bonus. But their agreement clearly said that I can withdraw my bonus anytime. I decided to wave goodbye to this broker and move forward. Why do some brokers lower the quality of their services when a client has been with them for a long time? 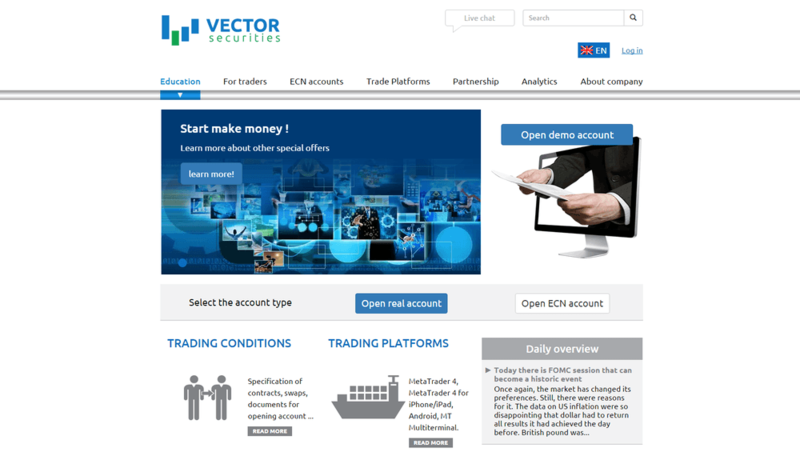 I started trading at Vector Securities with stable platform, fixed spread, and responsive customer support. But now that I've been with them for more than a year and have earned quite a good amount of money, their services just really started to go downhill. The platform often disconnects or lags. Then it doesn't execute the SL or TP even though the price already hit. This makes me lose my money. Then if before their support team is easily reached, now they only respond quickly through live chat. My emails are not replied to until after a few days. Even through calls, they are hard to reach. And the live chat representatives can't help much. They still advise me to contact the email of the department responsible. I've seen them providing excellent services so I'm pretty sure they can do so much more than this. Do they only show their good side to new traders? Shouldn't they value their long-time clients more because we chose them and stayed with them. Giving us poor service is what's gonna make us leave. What's the use of continuously having new traders when their old traders are leaving, right? In the Vector Securities Mt4platform didn't execute my SL and TP, even always my order was closed 20 to 50 pips from my position. So I am confused and I have asked Vector Security, support about these issues. They said these are a mistake and it will never happen again. I think the system problem is harmful to any traders to make a profit in the market. I have seen on the Facebook and review site that they are the unprofessional company who didn't care their traders! I have 6 months trading experience with this broker. Platform MetaTrader 4 is not that bad, but has delays during volatility times, as well as the spread. I made a profit of 150$ with EUR/JPY and EUR/CHF, then when I requested to withdraw the profit it took over a week to get the approval. I don't recommend Vector Securities because of the issues I already mentioned and the fact that the support team is never available to answer the calls, this things makes the broker not to be trusted. I opened a live account with Vector Securities with a first deposit of 250$, using Qiwi wallet as transfer system. I liked their demo account so I didn't though there will be delays and bugs on the live account. The platform crashed or having delays made me loss 100$ the first week of trading. After that was a constant struggle to trade with MetaTrader 4. I called their support team many times and is difficult to be found. I will close my account. Most of my trades were open for several minutes to several hours, I was unable to close all my open trades until I lost $300. During this they tried over and over again to spike my spreads sometimes up to 25 pips on the majors, which I said nothing about it. But now, I won't allow my $300 to go just like that! I am a client of Vector Securities for almost half year but their latest problems with the platform made me close my account. I had a standard account in USD currency with a first deposit of 300$ made with QIWI. I used only QIWI to withdraw money and deposit and I never had problems with that system. Any way, the broker is using volatility times to manipulate the market from a 2 pips spread which should be fix, the spread is up to 4 from a second to the other one. I called their support team but they don't answer to phone or e-mail. I made a nice profit the first 3 months around 500$ and I was able to withdraw the money, but eventually the problems with the platform made me close the account to don't lose what I won. Vector Securities must be the worst forex broker ever I have traded. I had a open trade on GPB/USD pair on Unemployment Claims news and there was a 54pips spike on my platform that took out my stop. And the same day I also got 41 pips slippage on EUR/USD pair and they ripped me off $321 very badly. I am just sick of their slippage. Time to search for other broker. Not recommended! My journey starts from their loyalty bonus. I was given $10 after I met the bonus conditions. The money was credited to my trading account number 971154. But before I used to bonus, I opened a demo trading account to practice and gain some knowledge about Forex market. Then one week later, I decided to use the free bonus to buy currency pairs such as USDJPY, EURJPY and EURUSD and held it for 2 days. Sold those currency pairs at a higher price with a reasonable spreads and I didn't encounter any slippage nor service interruption issues! Everything was smooth. My orders were honored instantly! If my memory serves me right, my profit those times was $15.54 and the management allowed me withdraw my earnings after I got the highest level of account verification. Since then, I convinced my friends to try them and avail the said bonus. Surprisingly, most of my friends didn't hesitate to venture the service offered by this company and now, they're still an active trader. I continue to promote the service of this company using the online platform including the social media, and public forums until I become an official partner of this broker. That was last year when I decided to apply as an affiliate partner and was thankful because they approved my application immediately. Now, I already referred 18 clients to them. After 3 weeks joining Vector Securities, I didn't earn any profit from them. Even though when I regist my real account all the process run fast and I find many happy and satisfied story from Vector Securities's trader about this broker nice trading platform and big profit and bonus they gives. But why I get a horrible process. I make a withdraw order but all system got error and my deposit is lose from my account. After 3 days, I call their customer support and then they said that my account must make an upgrade to high level trading account type. I asked about the rules and trading conditions, but they don't give me an answer me anymore. I hope everything getting better as soon as possible and I get my money back, before I close my trading account or find another broker.